Gone to See Florida 2017/2018 Road Trip. Day 7: Sunrise at Fort De Soto Park. I began the day early at Fort De Soto park with my brother to watch the sun rise under the Sunshine Skyway bridge. The sky was just starting to show some signs of light when we arrived. There was a line of clouds above the Skyway bridge, and it looked promising for the sun to come up under the clouds. 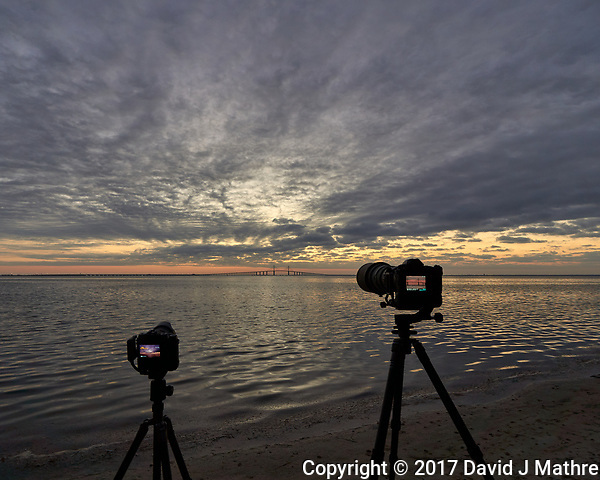 I set up two cameras, one with a 16 mm wide-angle lens, and one with a 500 mm telephoto lens to do time-lapsed sequences of sunrise.